We are the perfect venue for your parties and special occasions. 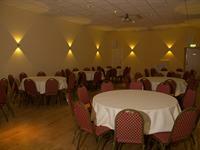 Our fantastic function room was totally purpose built in 2007. It is fully fitted out with state of the art lighting and audio visual equipment. Sitting at the very heart of the hotel on the first floor it can accommodate 150 people easily. We have a selection of different table shapes and sizes to suit every need. 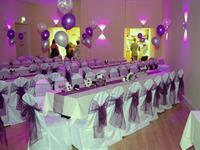 Our dedicated function manager is available to talk you through all options available to you. Our kitchen team can create any type of meals required for your party, from a sandwich buffet all the way up to a sit down 5 course A la carte meal. Function Buffet Sample. Our Set menus can be tailor made to suit your guests and your budget, Here are a few sample menus that we have provided previously for other guests. Set Menu Samples. From breakfast meetings to residential conferences with a full dinner menu, we will be happy to provide you with a quotation, our priority is to look after your every need and remain flexible to suit your individual requirements. Full business support services available, including fax, photocopying and email. 24 Hour Delegate Rate, £90.00 per person includes all the above plus DB&B accommodation with an allowance of £15.00 towards our A ' La Carte Menu. Our full conference package details can be downloaded from here. 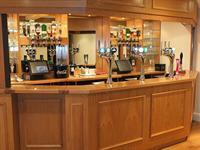 Our function room has its own brand new fully stocked bar with our usual great selection of Ales, Beers & Lagers. There is a great selection of attractions to choose from, some just a stones throw from the hotel and the rest just a few miles from us. Below is small selection of some ideas to keep the whole family occupied when visiting us. Click on the links below for more details.